Click to visit the full timeline at GeekDad. 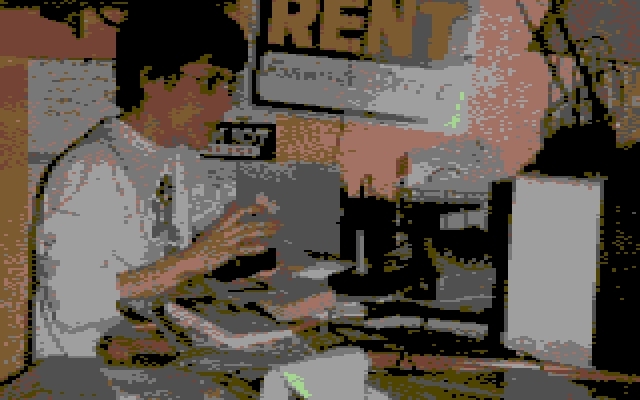 Me, circa 1984, converted by C64 Yourself. What makes this photo great? Not because that’s me, but because that’s me sitting at my typically clutter-covered desk playing Burgertime on my Commodore 64. Unfortunately, the C-64’s limited graphics capability falls short of capturing in detail my Gumby sweatshirt and oh-so-80s parted-down-the-middle haircut. Some things are best left pixelated. Despite an overcast afternoon – and, in fact, a brief period of really light sprinkling – Free Comic Book Day over at The Toys Time Forgot was fun. Met and hung out with some awfully nice people from the Little Hollywood Ohio film community and SuperHero 101, picked up the FCBD “Owly & Friends” issue (for Kelsey, of course! ), and sold a couple copies of Collect All 21. And hey, any opportunity to wander among shelves of old Atari, Activision and Imagic video game cartridges, comic-and-cartoon-and-movie-scene-laden drinking glasses (Collect Them All! 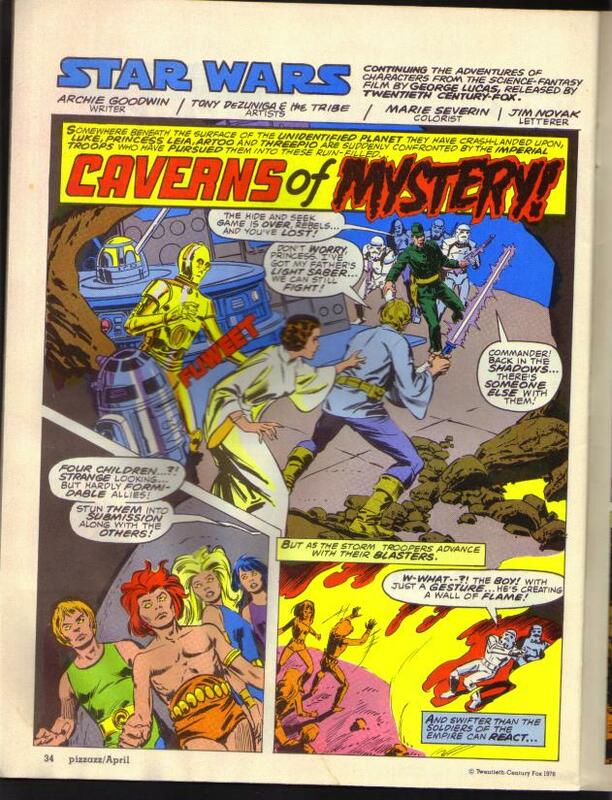 ), and racks of 1980s action figures – well, that’s time well spent. Photo courtesy of my OSWCC friend Ryan Meister. Sadly either the console or the power supply is shot, because I couldn’t get the system to fire up, but in my brain, it was like dynamiting an avalanche. As with things like Star Wars figures and trading cards, there’s a fantastic tactile memory embedded in holding these cartridges and feeling their particular weight and texture. 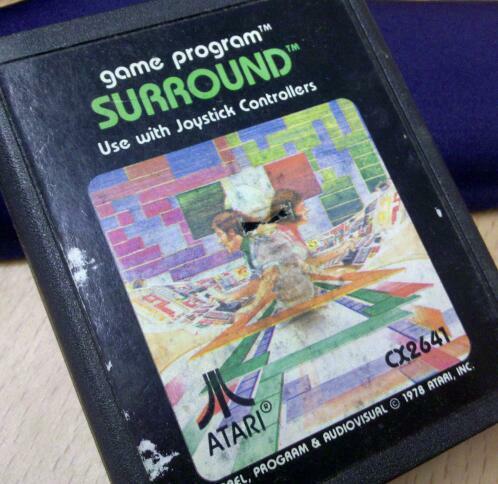 And the label art and the fonts and even the different casing structures that different game companies like Activision and Imagic and Coleco used once they entered the market – all these little things just trigger recollections and sensations, and I can see myself turning to this picture for some throwback writing in the not-too-distant future. With Kelsey now free of the Windows machine, I finally got around to setting it up in our back room, mostly so I can use the flatbed scanner. (The old Microtek parallel port never played well with the Linux machine, and I can’t justify buying a newer, nicer scanner at the moment.) 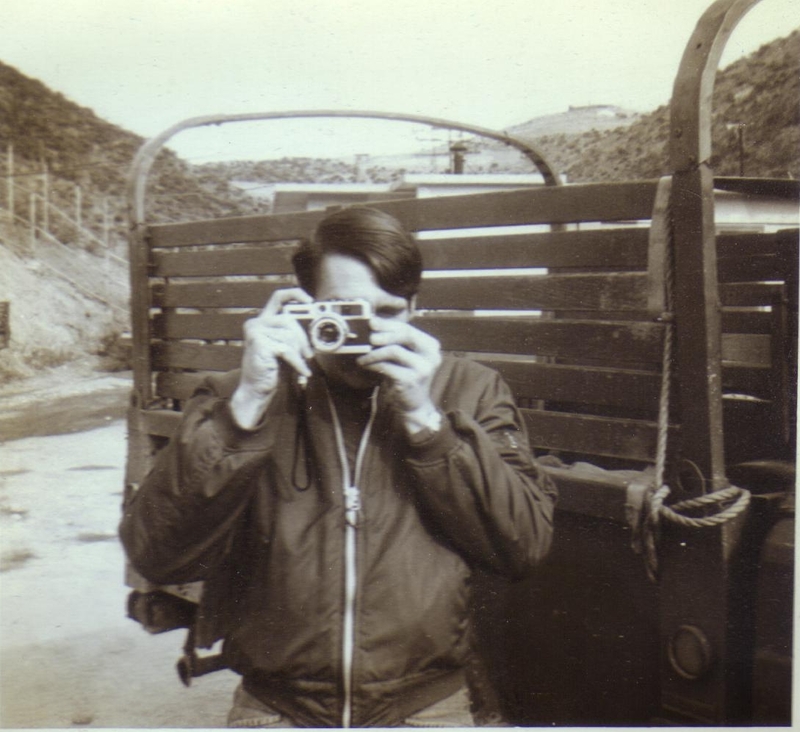 I’ve had some old pictures of Dad I’ve been wanting to preserve electronically for awhile now, so I used a couple for today’s test run of the reinstalled software. The first two are from Dad’s time in the Air Force. Richard E. Booth, Texas, 1968. The first one’s labeled on the back in Mom’s handwriting: Rich – basic training. 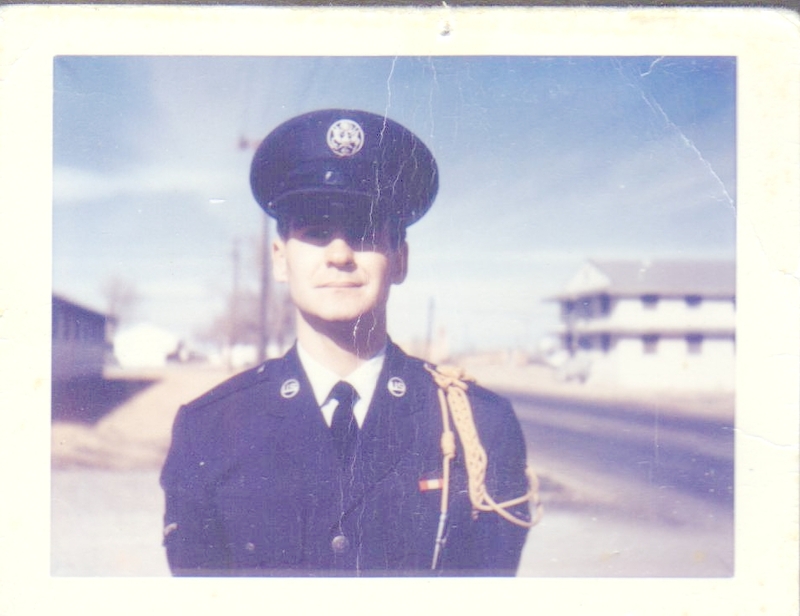 Amarillo 1968 or W. Falls 11/68. That makes my dad 21 years old. (Unless it’s before 5/5/68, in which case he’s 20. )The funny thing is, I look at this picture and see, well, my dad. Even though he’s just over half my current age in this photo, I can’t see him as just a couple years removed from being a teenager. Not that he looks old, but I can’t mentally detach the future Rich Booth from the one standing here under the Texan sky. ...and now you know where my cheesy sense of humor comes from. And yes, those hills do look like the ones in M*A*S*H, don’t they? 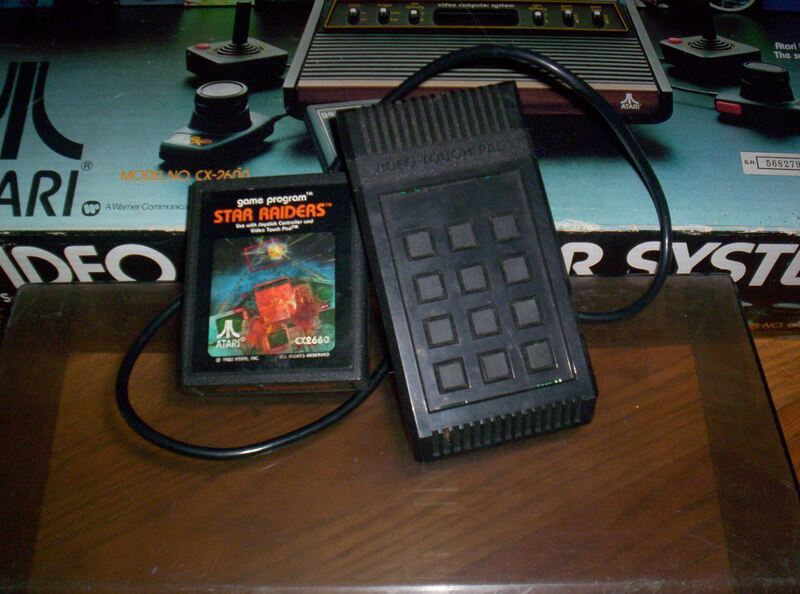 Now, I’m pretty sure my little brothers got this cartridge for Christmas, 1982 – I have a picture of them wearing their footie pajamas and excitedly holding the silver-and-red Atari game box over their heads – and I’m also pretty sure that’s the same Christmas I got my first camera – that Polaroid instant I mentioned earlier. That would explain why I have a bunch of weird, staged, fairly pointless pictures that all seem to reflect a pretty small time window. To the victor go the pixelated Reese's Pieces. 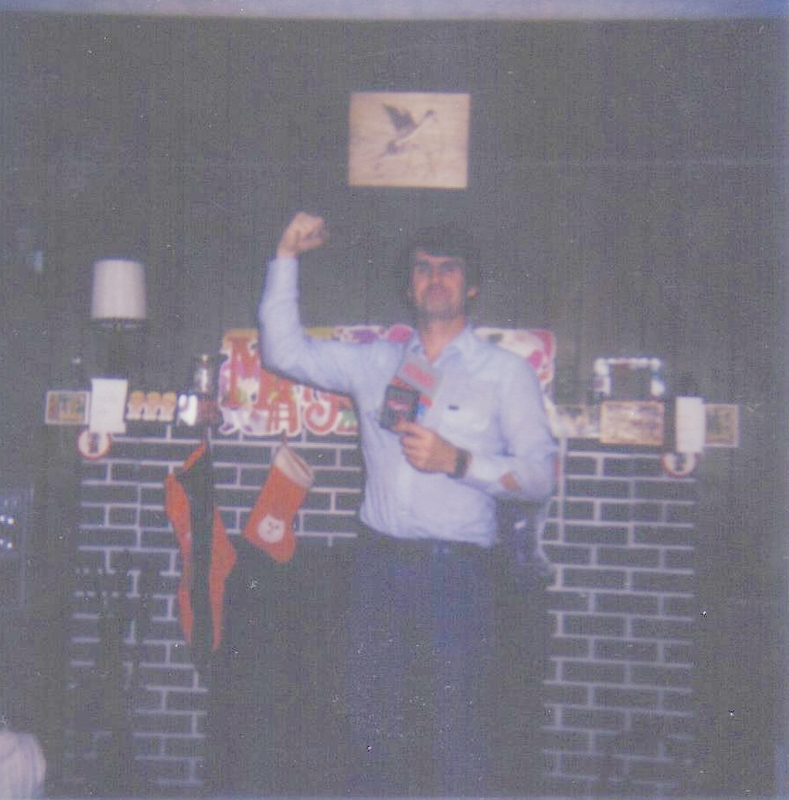 Case in point – this picture of Dad celebrating the triumph of being the first person in the Booth house to beat that effing E.T. game. I totally put him up to this pose, because, you know, I could take a picture of it! Now, what’s kind of weird about having picked these three pictures is that Dad is clean-shaven in all of them, despite the fact that he had a moustache for pretty much his entire adult life. (This time in the early 1980s when he decided to shave it off? He grew it back as soon as someone said he looked like his brother, my Uncle John. His significantly older brother.) In fact, outside of seeing these photos, it’s really hard to remember Dad without his moustache. I can remember taking this picture, and having having Dad stand there in front of the fireplace. And since the Christmas decorations are still up, I deduce two things: 1) It’s probably no later than the first or second week of January, 1983 and 2) We must have played the hell out of E.T. for those first few weeks we had it, because I remember that it felt like it took for-freaking-ever for someone to finally win at the damn thing. Every so often, whether it was while visiting the Aladdin’s Castle arcade at Belden Village, or the Goodtime Pizza place next to Children’s Palace, or even among the two or three periodically-changed video games inthe youth lobby at the YMCA, I’d see something magical on an unattended screen. A quick look around – just in case someone had put a quarter in and then taken a few steps away to grab their jacket or a Coke or something – and if nobody seemed to be Next In Line, well, then FREE GAME ON! And it didn’t matter what the game was: If it was free, I gave it a shot, even if it was something I never played or that I sucked at. A free game was a quarter saved, and a few extra minutes of video gaming I couldn’t have bought for myself. It was its own particular sort of thrill – different, somehow, from finding a quarter or a token, which gave you a free game of your choice, sure, but you still had to turn around and spend that coin. Twice in the past two weeks, I’ve been reminded of that eye-widening moment of fun: Free game! The first was at PAX East, in the American Classic Arcade Museum‘s room. I took a quick look into the place on day one, but didn’t get to go back and play until Saturday afternoon when Paul & Wendy and I went up there to spend some time. When we asked one of the staffers just inside the door “Quarters or tokens?” he grinned. I froze and looked around. Dragon’s Lair jumped out at me. Ms. Pac Man. Holy crud – a Flash pinball machine. 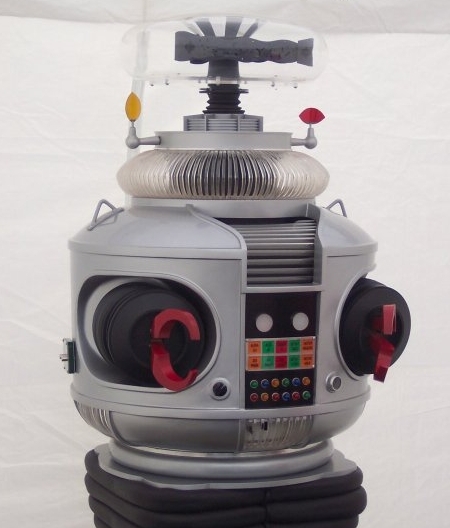 We beelined for the first machine we saw open: a sit-down Buck Rogers: Planet of Doom. I jumped in, and my blocky little fighter was screaming through space, and then over a dizzyingly-green-striped featureless landscape, where I had to swing back and forth between pylons that looked straight out of a 1950s sci-fi B picture. I don’t remember the game sucking this bad, I thought, but who freaking cares – FREE GAME!! 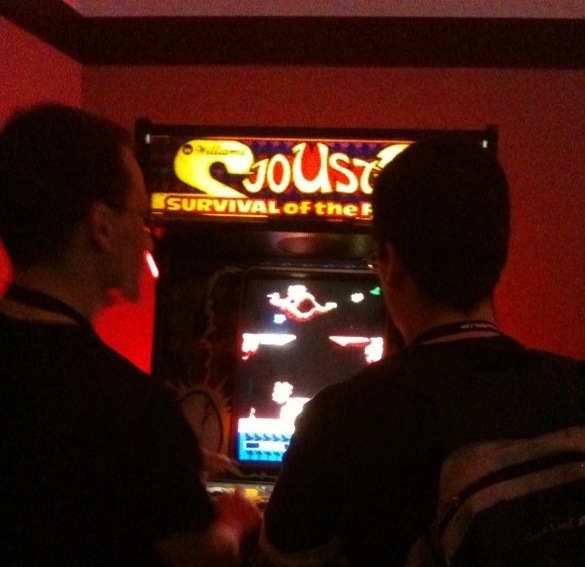 We hit Atari’s Food Fight next, and then Paul and I teamed up for a go at Joust 2. (Joust was a game I was never really good at but loved like hell to play.) We’re in there mashing buttons, swearing good-naturedly half under our breath – incidentally, my quip of choice when I’ve knocked off a video game enemy, flying bird or otherwise, comes from Die Hard: “Eat it, Harvey!” I find it underappreciated. – there’s eighties music playing, the room is bathed in that dim red-orange glow and the swirled reflected light of the screens. Wendy took this shot of us playing, and while I could have adjusted the color levels and brightness, this really kind of captures a feel I like, of remembering hours spent in this kind of place, watching over someone’s shoulder, waiting my turn to play. Then, last weekend, we went down to my mom’s house for an Easter dinner. A couple years back, my mom inherited a house and a couple actual arcade games therein. 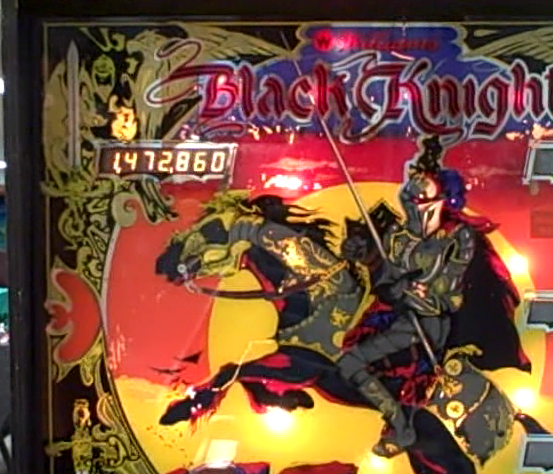 The Baby Pac-Man machine has worked since day one, and while we’ve gotten a lot of use out of it, I was always much more hyped about the Black Knight pinball machine. I also remember that it had a third flipper, way up on the right side of the playing field, which I’d never seen in a pinball game before, and that was cool, too. I remember racing from the locker room after swim lessons hoping to get in a game or two – or even just watch some older kid who was, you know, good – before mom or dad would come pick me up. And then along came Black Knight. Honestly, I can’t remember where I saw it first – I think it may have been on a family vacation to Florida with my friend Jacob along, but I’m not sure. This thing was so unlike any pinball game we’d ever seen. It had two levels, with a pair of flippers on each, and tunnels and ramps and these magnets beneath the playing field which I never quite figured out how to use and a thing called “multi-ball” where you could actually have three balls in play at the same time, and did I mention that IT TALKED?!? I mean, it really just blew my whole concept of “pinball machines” out of the water. And it was gorgeous, all black and red and gold and kind of Dungeons-and-Dragons-esque, and lined up next to other more garish and bright machines, Black Knight just looked like a badass. Of course, it also cost fifty cents, twice as much as a regular game. And you only got three balls instead of the usual five which I seem to think was the standard at the time. And it seemed really, really hard. But man was it fun. Pinball machines got more complex, of course, but I’ve never felt like anything made the quantum leap like this one did, and over the years, no matter where I found an arcade, if this machine was in it, at least two (or three) of my quarters were destined for the Black Knight’s coffers. So mom’s had this thing in the basement for awhile now,and though I’ve tried to help her with finding a suitable repair technician and all, it’s spent the entire time dormant and silent. Will. You. Challenge. Me. Again? THE. BLACK. KNIGHT. WILL. SLAY. YOU. HAHAHAHA!!! The synthesized speech and the sound effects poured into my ears, struck those chords of memory, and it was on. Kelsey and my brother and I took turns, re-learned the mechanics of the game, how to get the multi-ball, what targets and lights to watch for, and even how to activate the Magna-Saves which had mystified me as a kid. As I’m hitting the road for a weekend defined by gaming, it seems appropriate to share this bit of nostalgia found in an empty box. The Original. Click to zoom in and check out the games. 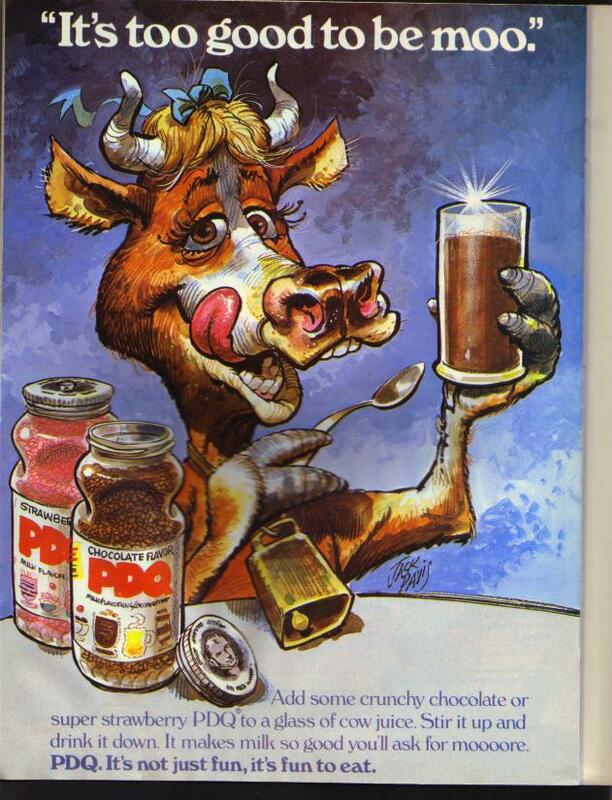 THAT'S packaging ART, my friends. 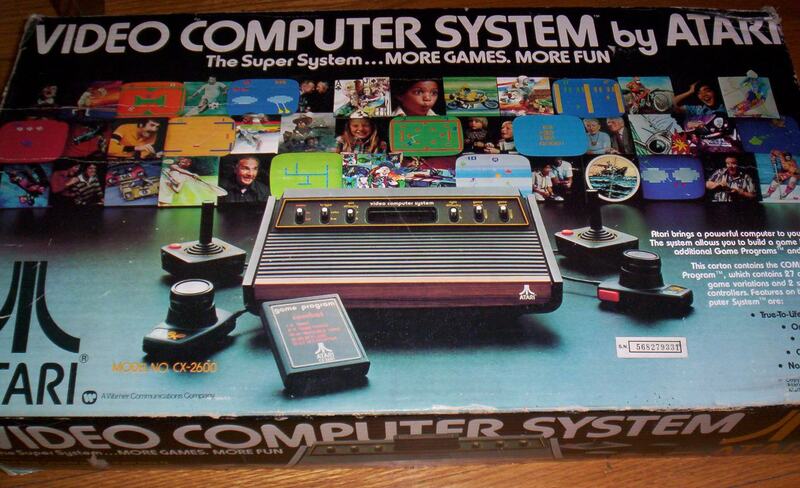 I don’t know why the box got saved – the system is, of course, long since dead or handed down to a cousin or garage saled or something – but holding it and running my gaze over that font and the images take me back almost more effectively than even playing the recreated games themselves on my Atari Flashback. And check out the back: Combat in all its glory. There was, in fact, one game cartridge and one controller stuck inside this box in the attic for years -along with the now-ridiculous-looking plastic shell that once served as a “dome” above the plastic-woodgrain case where the console itself sat, revered and protected. Man, it was almost like a real, you know, COMPUTER! 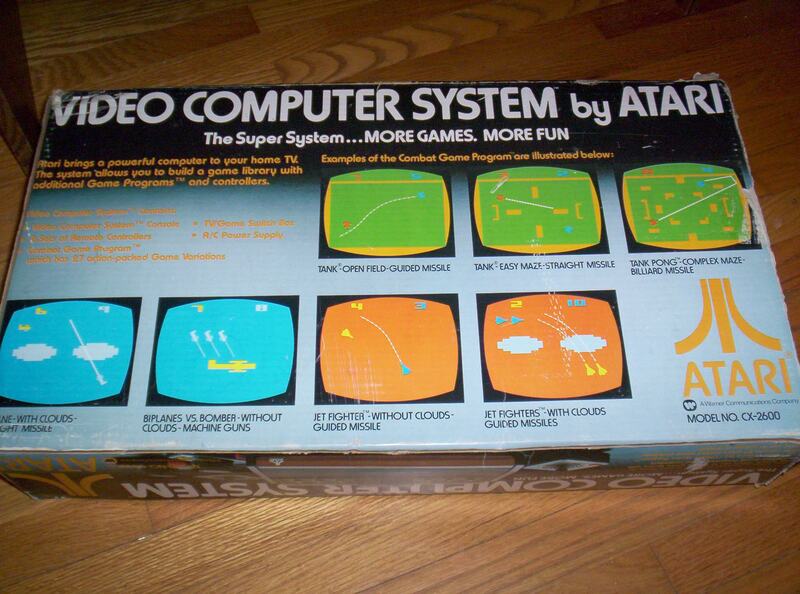 An Atari game was super special if it came in a really fat box, because you knew that meant it had a special controller in it, like the Indy 500 game we got for dad thathad a set of special driving “paddles,” or, in this case, that keypad which at one time had an overlay labeling buttons for warp speed and coordinates and stuff like that. Honestly, I don’t remember the game mechanics so much as I remember really thinking it was kind of like hunting TIEs alongside Red Five and the gang, and if I looked over my shoulder there in the basement, I’d see R2 in his socket, and the starfield receding behind him. Not long after my change in employment earlier this year, I got in touch with GeekDad editor Ken Denmead, who generously ran a couple guest posts I wrote in April and later included me on a very cool invite list, bringing me on board as a full-fledged contributor to the site. I’m incredibly thankful, because a) It’s GeekDad, and How Freaking Awesome; b) I’ve gotten to write pieces I wouldn’t otherwise have had the chance to, which inspired some writing I’m proud of. It has been tremendously neat playing a small role in the site and watching it grow, and one of my resolutions for 2010 is to write more for GeekDad than I did in 2009. 2) May 21 – Girls Against Girls – Figuring It Out With Bonnie Burton – It’s incredibly difficult to accurately describe how enjoyable this interview was, and the book’s lessons have come in handy more than once in my daughter’s middle school years. 3) June 11 – Nine Video Games Ripe for Rebirth – Not only was this a great trip down video-game memory lane, but ohmyGod ARCHON IS BACK!!!! 4) June 18 – Review: Swim Ways’ R/C Cyber Ray – Well, we got to play with a nifty toy that was only fun for a little while, but I like the way the review turned out, and who knows, maybe Swim Ways has ironed out the wrinkles by now. 6) July 9 – 10 Things Parents Should Know About Warehouse 13 – It was a good excuse to stay in and watch some SyFy channel with Kelsey, but the truth is, though we though the premiere was OK, we never watched another episode. 7) July 26 – Bubbles, Zubbles, Toys and Troubles – Although at its heart this is another toy review, I had a blast talking to inventor Tim Kehoe about his 15-year journey from the idea for colored bubbles to the final production this summer. 9) Sept. 21 – 10 Things Parents Should Know About Cloudy With A Chance Of Meatballs – Kelsey and I had gone to see this just for fun, and I was so surprised that I liked it so much that I jumped at the chance to do the GeekDad write-up. 10) October 6 – Princesses and Mermaids: Who Needs Rescuing Again? – We were introduced to Jim C. Hines and his books at Penguicon, marking yet another reason the trip to Romulus was so memorable. To circle back to the end of the first paragraph: c) It’s GeekDad, and How Freaking Awesome. Gobs and piles of thanks to Ken, Matt Blum and my fellow contributors and the Wired editors and everyone else I don’t know who makes GeekDad work. 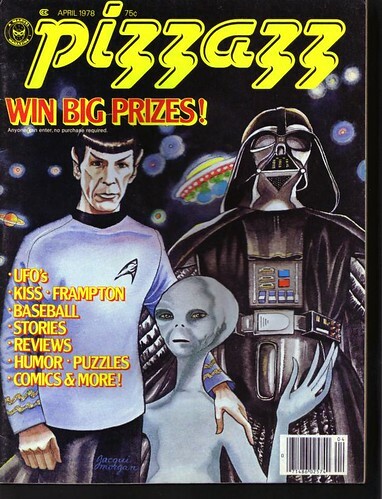 I have a potentially packed-with-awesome day ahead, though it will be hard-pressed to be as fully-loaded as this April 1978 issue of Pizzazz magazine. I bet aliens were responsible for that errant apostrophe. Star Wars comics with zombie kids! 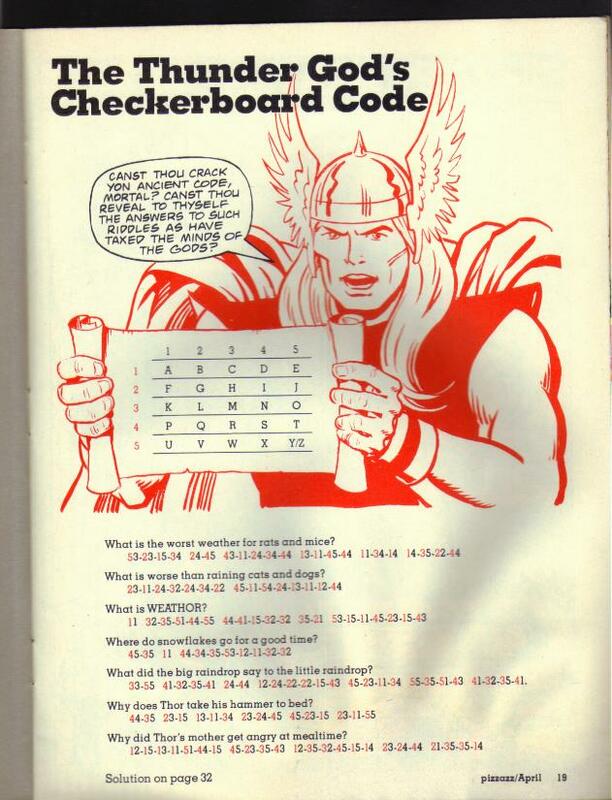 Thor the Thunder God’s Checkerboard Code! 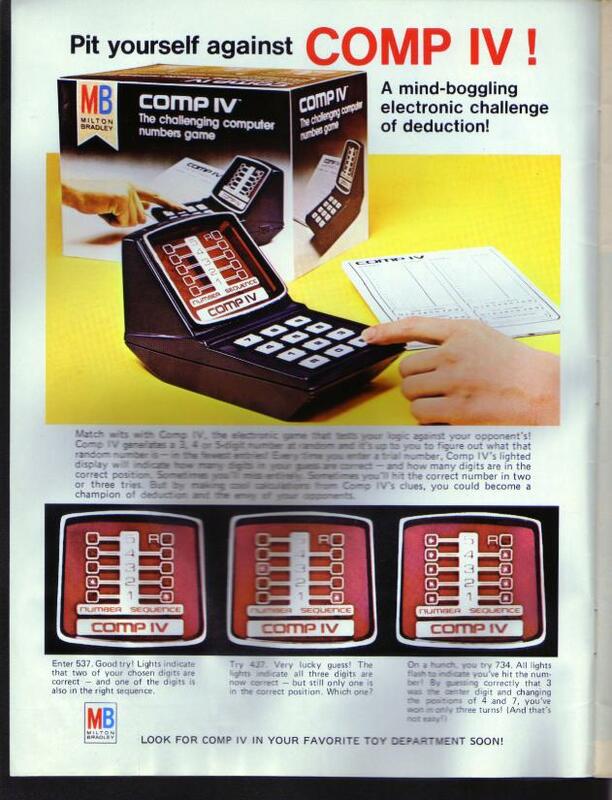 And remember the Comp IV – my uncle had one of these – and PDQ milk flavorings? Here – I scanned some of the best parts. 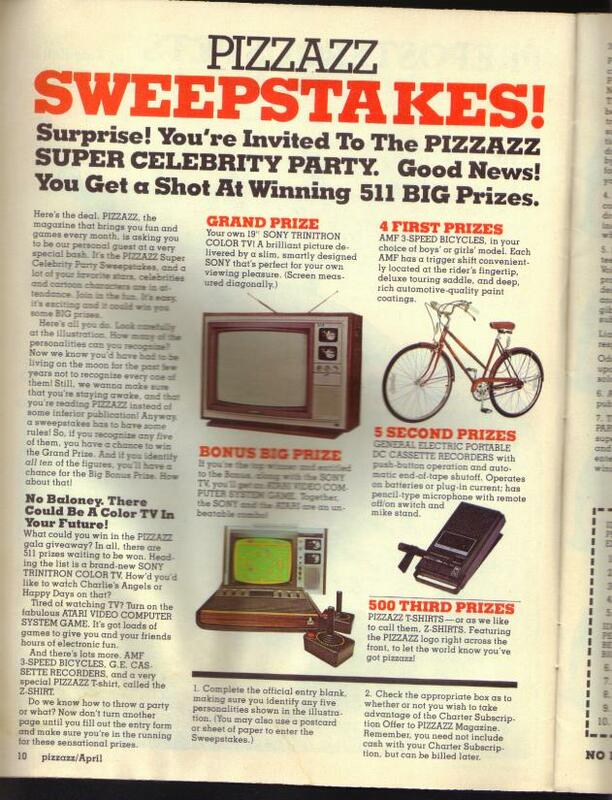 Try not to be too heartbroken that the sweepstakes deadline has long since passed, so that 19-inch Sony Trinitron Color TV and Atari Video Computer System combo Grand Prize is already in some lucky kid’s avocado-and-maize living room. LucasArts’ return to its classic Monkey Island video game series got me thinking of all the hours I spent on the family room floor playing Atari, succeeded by the basement setup with our couch and our Commodore 64 and stacks and stacks of floppy disks packed with games from to Agent USA to Zork. I came up with a list of nine I’d love to see reborn for a new generation of consoles and players, and had a ton of fun writing it up for GeekDad: Nine Video Games Ripe for Rebirth.